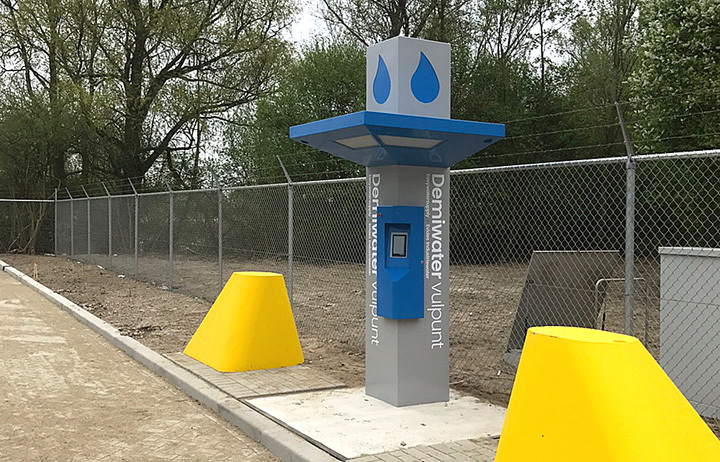 diz installed the first control kiosk for Evides Industrial Water in Dordrecht, commissioned by EyeQube. Evides offers bespoke industrial water services to large industrial customers in the Netherlands, Belgium, Germany and elsewhere. The Evides water company is in the hands of public shareholders (municipalities and provinces). The second control kiosk will soon follow at an as yet unspecified location. The demineralised water filling point has LED lighting in its awning and is also fitted with a climate control system. The aim of this control kiosk is that demineralised water can be loaded in an accessible way, comparable with a drive-in. EyeQube designed the software (app) with which the driver can collect a specific quantity of water. The driver connects his lorry to the water supply with a hose, whose connector is incorporated in the kiosk. The lorry is then loaded with the demineralised water. With the use of the specially developed software the amount of water that is loaded is immediately communicated to the adjacent production facility.